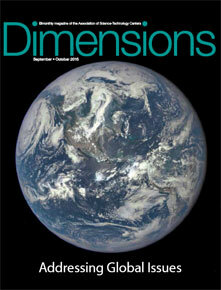 As this issue of Dimensions goes to press, world leaders are preparing to convene at the UN Sustainable Development Summit in New York City to formally adopt the post-2015 development agenda, committing to 17 ambitious new Sustainable Development Goals. So many of the critical issues facing our planet—from climate change to public health to food and energy security—are based in science. As trusted institutions with the ability to clearly communicate science to diverse communities, science centers and museums are ideal institutions to address these global issues. Over the next several years, ASTC plans to lead our field in projects and events—including at COP21 and the Science Centre World Summit 2017—that will position science centers as partners and leaders on these issues. In this edition of Dimensions, we look at effective approaches and practices to help science centers take on this important challenge. Viewpoints: If you could go back, what advice would you give yourself when you first started your museum or informal education career?